Can you give back to your community just by purchasing a new bed? With Sleep ZZZ’s dedication to charity work, you can. The company donates 1 percent of every purchase toward environmental research, along with donations to breast cancer research and the LA Food Bank. Community-minded shoppers will appreciate the knowledge that they are receiving an environmentally friendly product that gives back to the world around them. 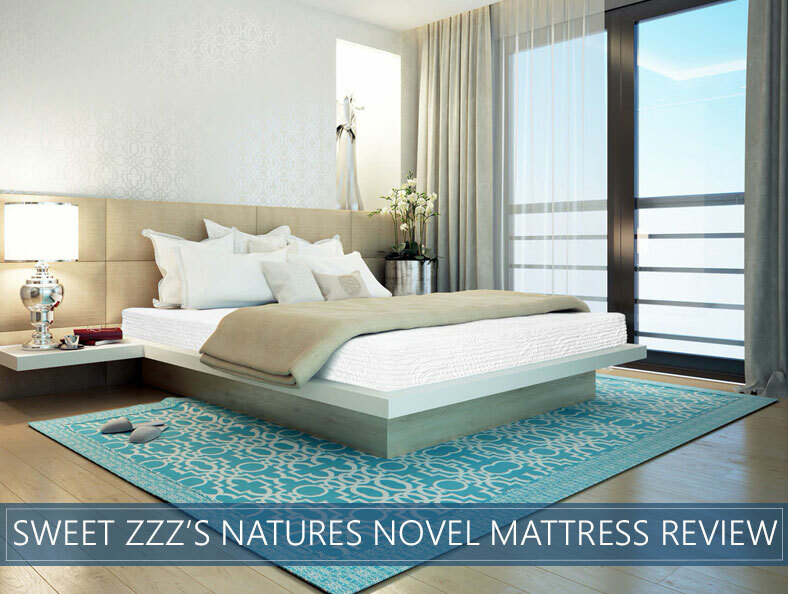 Our in-depth overview of the Nature's Novel bed will look at the bed’s construction and features and will give you an idea of who it is best-suited for. We will also provide scores based on Firmness, quality, value, and more. Read the entire review to get an in-depth analysis of this product. Or skip to the end for our rankings and a quick overview of our impression of this bed. 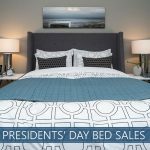 Want Firm support – With a responsive upper layer and a denser core, most shoppers should experience a Firm comfort level and solid support of the bed. Prefer a quick response – The latex layers in this bed should be very quick to respond, which should allow the comfort layer to reshape very quickly when you move around. This can be of great benefit to restless or combination sleepers who switch positions throughout the night. Are a stomach sleeper – This mattress should have a Medium-Firm to Firm feel, which is usually ideal for stomach sleepers. The hips should be well-supported, which should minimize sinkage and promote a neutral spine. Are an exclusive side sleeper – Side sleepers often prefer a Softer comfort level that allows heavier areas to burrow a little deeper into the bed, helping to reduce pushback and pressure while aligning the spine. This mattress may feel a little Firmer, making it more ideal for stomach sleepers and back sleepers who prefer Firmer support. For more picks, see our top mattress page. Nature’s Novel is a latex bed-in-a-box product. This bed can be used on any frame, including your old base, an adjustable frame, or the floor. The cover is made up of 1 inch of wool and cotton quilted together. The cover should feel soft to the touch and the wool is meant to promote a temperature neutral experience. The company recommends adding a removable Tencel cover for easier cleaning. This mattress stands 12 inches in height. The first layer contains 4 inches of Talalay Latex. This layer should feel somewhat airy and breathable allowing for enhanced airflow. You should notice a temperature neutral experience on this layer. The second layer consists of 7 inches of Eco-Latex foam. The combination of Dunlop latex and foam should feel denser than the upper layer to provide more structure and support for the entire bed. 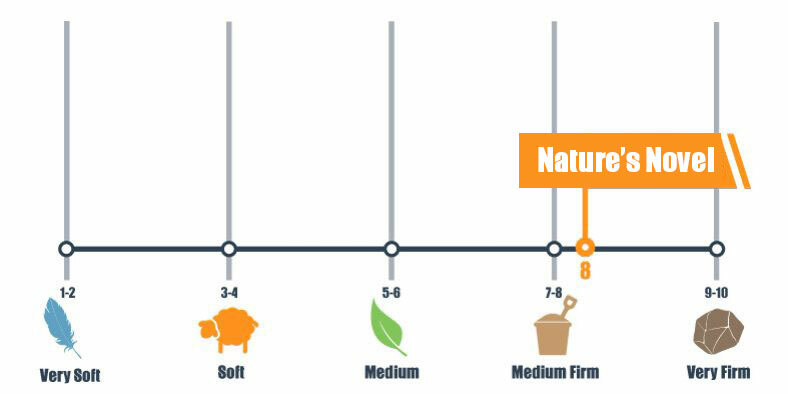 We rank this mattress at an 8 on our Firmness scale, which uses a 1-10 system where 1 is super Soft and 10 is very Firm. This lands this product at a Medium-Firm to Firm feel depending on your weight and sleep preferences. Heavier sleepers and back or stomach sleepers may be most satisfied by this Firm level of support. The firm, buoyant support of the latex should provide very minimal sinkage when lying on this bed. Most sleepers should feel as though they are floating on top of the mattress. The latex should provide gentle contouring to promote pressure relief and a neutral spine alignment. There should be noticeable bounce and a quick response from the springy nature of the latex. This should help reduce difficulty in repositioning, making this product a good choice for most combination sleepers who switch up their sleep position frequently. Back sleepers who like a Firmer feel should enjoy strong lumbar support and a neutral spine. Most stomach sleepers should find this mattress is Firm enough to prevent their hips from sinking into the upper layer, which should help to keep the spine well-aligned. Some side sleepers may find this bed to be a little to Firm for their needs, they may experience some pressure points building in the heavier areas of the body like the hips and shoulders. These sleepers may want to consider a softer mattress to reduce pushback and aid pressure relief. The company recommends a weight limit of 300 pounds per person or 600 for the entire bed. 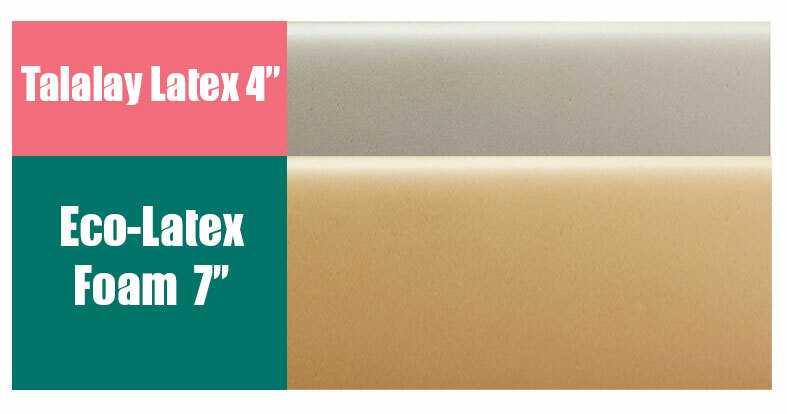 Latex often falls in the middle, reducing motion control as compared to innerspring beds, but not always absorbing as much vibration as a traditional memory foam bed might. Nature’s Novel performs as expected for a latex product. Those are exceptionally concerned with motion transfer may want a denser, memory foam-based bed, but the foam blended into the denser Dunlop latex layer should help minimize most movement-based sleep disruptions. Some compression may be noticed when lying or sitting on the edge, which is normal for latex or foam-based products. The Firm latex should provide slightly more enhanced edge support than other all-foam bed-in-a-box options. This should help to give the mattress a bigger feel, which may be ideal for couples or people who like to sprawl out. Trial Period – This product comes with a 100-day trial period. Warranty – Sweet ZZZ offers a lifetime warranty. Shipping – Shipping is free within the contiguous United States. An extra fee is required to ship to Canada. The company does not currently ship to Alaska or Hawaii. Oeko-Tex Certified – The latex in this mattress is certified to be free of harmful materials such as mercury or lead. This certification classifies this product as safe for children under 3 years old. Charitable Donations – Sweet ZZZ works hard to give back to the community. The company is a member of 1% For The Planet, donating 1 percent of all sales to environmental causes. They also work in partnership with the LA Food Bank and the Breast Cancer Research Foundation and will attempt to donate suitable returned products. Back and stomach sleepers who like a Firm support and a floating on the mattress feel should appreciate this bouncy, temperature-regulating mattress. Sleep ZZZ is dedicated to making the environment, and your bedroom, cleaner and healthier. This commitment really shows through the company’s work with several different charities and their use of certified latex products. This bed combines a dense layer of latex with a more springy one to minimize sinkage and promote easy repositioning while also helping to absorb motion transfer. Sleepers who prefer a Firm comfort feel should appreciate the pressure relief and solid support of this mattress. We see a lot of value in this product that puts the health and well-being of its customers and community first. Memory Foam vs. Latex Compared – Which is Better for You?